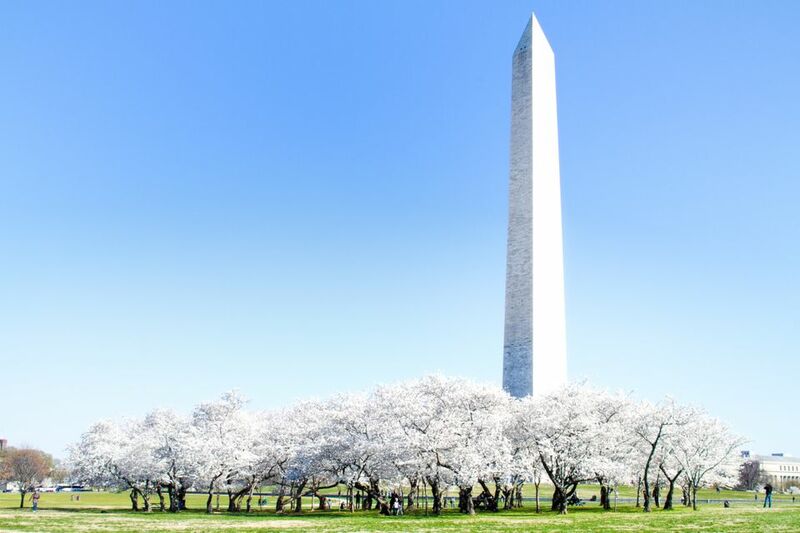 The Washington Monument, a memorial to George Washington, our nation's first president, is the most prominent landmark in Washington, DC and stands as the centerpiece of the National Mall. It is the tallest structure in Washington, DC and measures 555 feet 5 1/8 inches high. Fifty flags surround the base of the Washington Monument symbolizing the 50 states of America. An elevator takes visitors to the top to see a spectacular view of Washington, DC including unique perspectives of the Lincoln Memorial, the White House, the Thomas Jefferson Memorial, and the Capitol Building. Sylvan Theater, an outdoor amphitheater located near the base of the Washington Monument, is a popular venue for a wide range of events including free concerts and live theatrical performances, commemorative ceremonies, rallies and protests. The Washington Monument is currently closed to visitors. The elevator is undergoing a modernization project which is expected to cost up to $3 million. The project is being funded by philanthropist David Rubenstein. The monument is expected to reopen in 2019. Tickets are not available at this time and visits will resume when the repairs are complete. Constitution Ave. and 15th St. SW.
Sylvan Theatre is an outdoor amphitheater located at the northwest corner of 15th Street and Independence Avenue near the base of the Washington Monument. The site is a popular venue for a wide range of events including free concerts and live theatrical performances, commemorative ceremonies, rallies and protests. Many proposals were made to build a monument dedicated to George Washington following the victory of the American Revolution. After his death, Congress authorized the construction of a memorial in the nation's capital. Architect Robert Mills designed the Monument with an elaborate plan for a tall obelisk topped with a statue of Washington standing in a chariot and a colonnade with statues of 30 Revolutionary War heroes. Construction of the Washington Monument began in 1848. However, the design was simplified and not completed until 1884, due to lack of funds during the Civil War. Beginning in July 1848 the Washington National Monument Society invited states, cities and patriotic societies to contribute memorial stones to commemorate George Washington. The 192 memorial stones adorn the interior walls of the monument. From 1998 to 2000, the Washington Monument was restored and a new information center was built just below the observation deck. In 2005, a new wall was constructed around the monument to improve security. A 5.8 earthquake in August 2011, damaged the elevator and portions of the monument between 475 feet and 530 feet above ground. The monument was closed for 2.5 years for repairs that cost $7.5 million. Just two years later the elevator stopped working. The monument is currently undergoing repairs.